Coconut macaroon cookies are a springtime classic. 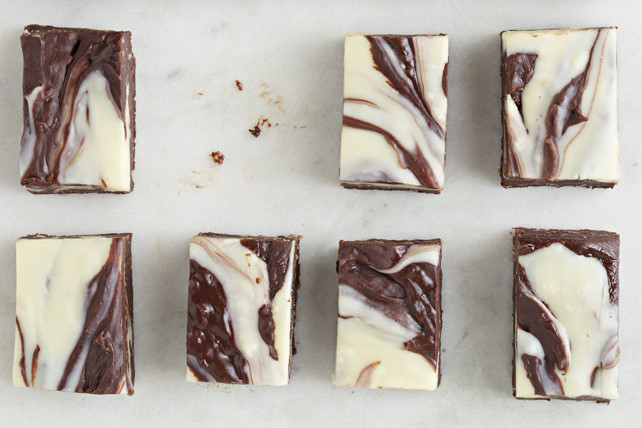 Turn those flavours into a marbled 4-ingredient foolproof fudge. Line 8-inch square pan with foil, with ends of foil extending over sides. Microwave semi-sweet chocolate and 1 cup milk in medium microwaveable bowl on MEDIUM 1-1/2 min. or until chocolate is almost melted, stirring after 1 min. ; stir until chocolate is completely melted and mixture is well blended. Add coconut; mix well. Spread onto bottom of prepared pan. Microwave white chocolate and remaining milk in separate microwaveable bowl 1-1/2 min. or until chocolate is almost melted, stirring after 1 min. ; stir until chocolate is completely melted and mixture is well blended. Drop by tablespoonfuls over semi-sweet chocolate layer; swirl with knife. Refrigerate 2 hours. Use foil handles to lift fudge from pan before cutting to serve. Wrap fudge in plastic wrap, then refrigerate until ready to serve. Prepare recipe as directed. After swirling fudge, immediately sprinkle with 1/2 cup toasted slivered almonds; press lightly into fudge with back of spoon. Refrigerate as directed.